my eyes are closed! How delicious is that "awesome icing" on the embarrassment cake?! 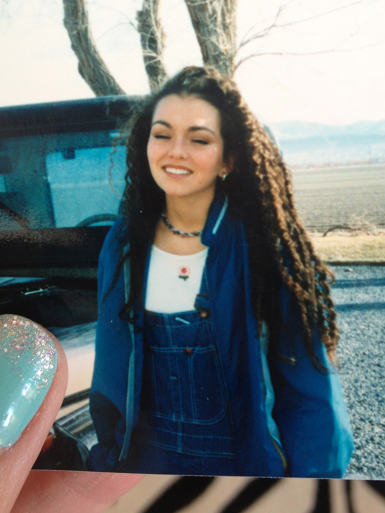 MY HAIR: was not permed, that is how I'd do it- put like 6 braids in my hair at night after I washed my hair. Sleep on it. Wake up and take em out and my hair would look like that! SHIRT: baby doll tee (anyone remember those) with a flower applique I put on it. NECKLACE: I made it- just a bunch of colored seed beads wrapped around my neck a few times. OVERALLS?!? : yes, these were a super huge pair of overalls that I loved. You look so pretty :) I love seeing all your throw back Thursday pictures! Your childrens,specially Jordan,may think you were very pretty in that picture.It must be weird for him having such a mom,because their mates must say u're beautiful and hot.Even if has posters of girls in his bedroom he thinks in the bottom of his heart: sorry babies,but my mom is waaay better! Take care,a super XXL hug,and un besito! omg you look kinda like victoria justice!